A Micro Enterprise is an enterprise that has fewer than 10 employees and has either an annual turnover and/or annual balance sheet not exceeding €2 million. A Small Enterprise is an enterprise that has fewer than 50 employees and has either an annual turnover and/or an annual balance sheet total not exceeding €10 million. A Medium Enterprise has fewer than 250 employees and annual turnover below €50 million or balance sheet below €43 million. How many SMEs are there in Ireland? According to the latest figures from the Central Statistics Office (CSO), there are 248,344 Small Medium & Enterprises active in Ireland. How many people are employed by SMEs? The latest CSO Business Demography results from 2015 show that 968,881 people are employed by SMEs. Do I need to provide my employees with a contract of Employment? Yes, even as a small business employer you must provide a new employee with the written statement of employment terms no later than two months after his/her start date and to existing employees within two months of their requesting it. ISME Members can avail of both advice and templates on Employment Contracts within our Members’ Area. What are the public holidays and who is entitled to benefit from them? Full time employees have an immediate entitlement to public holiday benefits. Part-time employees must have worked at least 40 hours in the five weeks ending on the day before the public holiday to qualify for public holiday benefit. What are the annual leave entitlements of my staff? An employee who has worked at least 1,365 hours in the leave year is entitled to the maximum of 4 working weeks’ annual leave unless the employment ceases during the leave year. Where any of these methods are applicable, whichever method gives the greatest entitlement to the employee is the one upon which the entitlement should be calculated. For those working part time, annual leave entitlement is normally calculated at 8% of their working hours. Can I decide when my employees take their annual leave? For the most part, yes. However, the onus is on you, as the employer to ensure that your employees are using their annual leave entitlement within the annual leave year. While the timing of annual leave is at the discretion of the employer, you must have regards to the employees need to reconcile their work and family responsibilities. There should be a genuine business reason for refusing an annual leave request. If leave dates are to be nominated by the company, a consultation should take place with the employee or their representative at least 1 month prior to the annual leave commencement date. Recruitment – I need staff, how do I recruit them? First write a job description – what do you need them to do/what would be their responsibilities? Then decide is this a full-, part- or fixed-term position and consider where they would ‘fit in’ to your business? Next, describe the qualifications and experience the candidate should have and decide what their remuneration will be. Then decide the recruitment method – via an agency, local press or just from word-of-mouth (via current employees, family and friends). ISME Members can access application form templates, interview score sheets and recruitment advice through our Members’ Area and HR helpline. Can I dismiss an employee within their probationary period? While an employee can be dismissed within their probationary period, it should be done with caution. “Fair procedures” must be followed. This can include following the full disciplinary process unless this is expressly excluded within the probationary clause in the contract of employment. Even with this clause a shortened version of the disciplinary process should still be applied. This can include providing the employee with an indication of where their performance is falling down, offering them reasonable opportunity to improve and giving them the chance to have their say prior to making any decision regarding their future. Further advice on managing an employee’s performance during their probationary periodis available to ISME Members within our Members’ Area. What is the minimum wage and to whom does it apply? 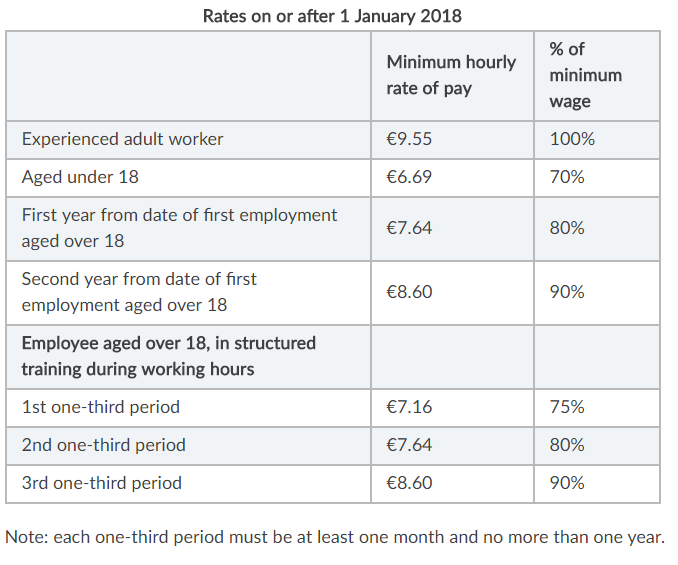 As of 1st January 2018 the national minimum wage increased to €9.55. The minimum wage relates to any “experienced adult worker” whether full-time, part-time or fixed term. .
How do I make changes to an employee’s contract? A contract of employment cannot be altered unilaterally by one party. Any changes must be made in consultation with the employee(s) concerned. Can I require my employees to retire at a certain age? It is no longer possible to require employees to retire purely on age grounds, as this might be considered age discrimination. Even if you have a mandatory company retirement age stated in contracts of employment, you still need to demonstrate justification for retiring employees. Ascertain what the employee’s intentions are – do they wish to continue working? If so, you may need to conduct a risk assessment to determine if they can safely continue in their current role: You might need to consider making some adjustments or offer an alternative role. How do I manage absence within the workplace? Absence management is arguably one of the greatest challenges for any employer due to its sensitive nature. Successful absence management is reliant on strong procedures being implemented in the workplace. While absence management is a difficult aspect of people management, there are certain steps that you can take to manage absence within the workplace: • Implement a sickness policy outlining notification and certification requirements, details of sick pay scheme (if applicable) and an indication of how the company will approach attendance issues (e.g. disciplinary procedure for absence) • Conduct regular and consistent Return to Work Interviews in order to accurately maintain absence records and to act as a deterrent for non-attendance for non-genuine reasons • Make employees aware when their absence is falling below the required standard and if all else fails commence disciplinary action in line with the company sickness policy. Young People – What do I need to know about employing people under 18? The Protection of Employees (Young Persons) Act 1996 contains the restrictions of hours of work and minimum rest breaks and the National Minimum Wage legislation contains all the information on minimum rates of pay. Employer Obligations Employers must keep a record of all start and finishing times for all employees under 18 and ensure that they are providing rest breaks as stipulated above. What do I need to know about Paternity Leave? Paternity Leave entitlements the Father, Civil Partner, Spouse or Cohabitant of a Mother, or an adopting Parent, to 2 weeks leave upon the birth of their child. This leave must be taken within 26 weeks of the birth and generally must be taken in one consecutive 2 week block. There is no obligation on the employer to pay the employee during this leave period, however, the employee may be entitled to a Paternity Benefit of €235 per week from the Department of Social Protection, based on the same PRSI contributions as Maternity Benefit. Paternity Leave is a Protected Leave type. Therefore, the employee is entitled to return to same role that they held prior to the leave, and any termination, notice of termination or suspension issued during the leave will automatically be considered void. Employees will continue to accrue their public holidays and annual leave during this period of leave. What are my obligations to staff on Health and Safety? ISME Members can avail of further information through both our Members’ Area as well as our HR Helpline. What should I do if there is an accident at work? All accident details should be recorded. You are obligated to report any accident that results in an employee being absent from the workplace for 3 consecutive days following the accident to the HSA. What accidents need to be reported to the Health and Safety Authority? 5) Any person who is not an employee but, as a result of an accident related to the workplace or a work activity, suffers an injury or condition which results in the person being taken from the location of the accident to receive treatment. What services are available that will help me to recruit or retain an employee with a disability? There are a wide range of schemes open to employers that provide great support when you are attempting to recruit and retain an employee with a disability. For more information on supports that you can avail of please click here. “Inclusive Recruitment” is a phrase given to a recruitment process that is open to all individuals. It is considered best practice to ensure inclusive recruitment within your organisation. Further advice on implementing an Inclusive Recruitment Policy within your company can be found here. What funding is available for employers recruiting a person with a disability ? What funding is available for employers to improve access to buildings? You should contact your local Workplace Contact in the DSP. Also check out the Employee Retention Grant Schemes (ERGS). This scheme helps employers to retain employees who acquire a disability. For new employees with a disability (as opposed to an existing employee) check out the Workplace Equipment/Adaptation Grant (WEAG) to adapt the workplace or buy specialised equipment for staff with disabilities. The maximum available grant is €6,348.70. How can I apply for the workplace adaptation grant? If you are a person with a disability who has been offered employment, or who is in employment and about to change job as a result of re-deployment or promotion, or who is about to become self-employed, and if you require a more accessible workplace or adapted equipment to do your job, you or your employer may be able to get a grant towards the costs of adapting premises or equipment. What should I know about disability disclosure? A person with a disability has a choice whether to disclose it or not-there is no obligation on them to do so either at interview stage or when they become employed with the company. It is therefore essential that when recruiting you are clear on the competencies required for the job and provide as much information as possible on what the job entails to allow people to determine for themselves whether they will be able undertake the main responsibilities. Where an employee or prospective employee does disclose a disability to you, you have a duty to make reasonable accommodations to ensure the workplace is accessible to them. How do I ensure that my organisation is fully inclusive for those with a disability? There are a number of simple things you can do to create and maintain an inclusive workplace. Begin by ensuring your recruitment process is inclusive. State clearly that you welcome applications from people with disabilities. Be clear on the job requirements and the qualifications needed. Ensure you concentrate on what needs to be done rather than how it is done. Use consistent criteria to assess every applicant regardless as to whether they have a disability or not. Never discriminate against a candidate on the basis of a disability. What is reasonable accommodation and what do employers need to know? The Employment Equality Acts 1998-2015 require employers to take reasonable steps to accommodate the needs of employees and prospective employees with disabilities. “Reasonable accommodation’ is where an employer makes a change to the tasks and structure of a job, or makes changes to the workplace environment so that an employee with a disability can fully do the job and enjoy equal employment opportunities. However, If you have to make changes to the workplace or work practices to accommodate a disabled employee, the demands should be ‘reasonable’ and should not impose a ‘disproportionate burden’ on you.